A story published by Forbes on Tuesday tracked what it portrayed as a web of deception spun by Commerce Secretary Wilbur Ross. But the story also cast a critical shadow over Forbes' own reporting, and raises serious questions about the credibility of the magazine's widely-cited ranking of billionaires. The article, a 3,000-word feature written by Forbes reporter Dan Alexander, alleges that Ross repeatedly embellished his net worth by crediting himself with his investors' money. Alexander's digging apparently began last month, when the magazine told Ross that he was being taken off The Forbes 400, an annual ranking of the richest people in America. Financial disclosure forms filed after Ross' nomination to the Commerce Department showed he had less than $700 million in assets, far lower than the $2.9 billion Forbes had listed as his net worth a year earlier. And Alexander claims he ultimately found that Ross had been inflating his worth dating back to 2004, when he had first cracked The Forbes 400. "It seems clear that Ross lied to us, the latest in an apparent sequence of fibs, exaggerations, omissions, fabrications and whoppers that have been going on with Forbes since 2004," Alexander wrote. Forbes bills the Forbes 400 as "the definitive list of wealth in America," and it has been cited by news outlets the world over. It's also a status symbol for the members of America's gilded class who are interested in such things. Related: Who is Wilbur Ross? But Forbes wasn't alone in identifying Ross as a billionaire. At the time Alexander's story was published Tuesday morning, Bloomberg also had his worth listed at $2.9 billion. A Bloomberg spokesman said it has not yet changed its valuation of Ross, which the outlet said was based on "the performance of his WLR Recovery funds, disclosed terms of the 2006 sale of his investment firm to Invesco for $375 million and information provided directly by the private equity investor after his nomination to serve in the Trump administration." Forbes continued to list Ross' worth at $2.5 billion on a rankings page after the story was published Tuesday, before dropping it to $700 million. In a statement to CNNMoney, Forbes spokeswoman Christina Vega defended the magazine's reporting methods, but acknowledged that others have lied in an effort to crack the list. "There have been rare instances in the history of the list in which people have blatantly lied to us in efforts to move their fortunes up or down. We try to spot those cases as soon as possible and report on them immediately to our readers. The reporting on Wilbur Ross shows how committed we are to uncovering new information year after year, and our willingness to set the record straight when we do get new information." In a statement, a spokesman for the Department of Commerce said, "The Forbes cites employees, without full knowledge, and all but one anonymously -- we will not respond further. "Secretary Ross's disclosure documents were compiled by legal counsel and accountants. The relevant rules were followed, and the documents were closely reviewed and approved by ethics officials at the Department of Commerce and the Office of Government Ethics. We regret any earlier miscommunication." Vega, however, pushed back on that. "Wilbur Ross himself has confirmed in his disclosures that he now has $700 million or less in assets," Vega said in an email. "The Forbes story is based on extensive reporting, including the financial disclosures that Ross filed this year, what Wilbur Ross told Forbes, and what former longtime employees told Forbes. Forbes has numerous sources who were next to Ross while he was making his money, who have run through, with specifics, how there is no way he accumulated even $1 billion, much less than the $3 billion he claimed." The precise worth of billionaires is often shrouded in mystery, especially when a substantial portion of their money comes -- as Ross' does -- from private companies that do not have to provide public accountings of their finances. Rankings like The Forbes 400 are often taken with more than a few heaps of salt as a result. President Trump's net worth, for example, has long been the subject of scrutiny, including at Forbes. "There's been a rule at Forbes for the last 30 years," Forbes editor Randall Lane said in 2015. "Take what Trump says and divide by three." The most recent edition of the Forbes 400 came out last month; it marked the 36th year the magazine has compiled the rankings. Each year, the list is accompanied by an explanation of the research that goes into the list. "Our reporters dig deep. This year we started with a list of more than 600 individuals considered strong candidates," the magazine explained last month. "When possible, we met with Forbes 400 members and candidates in person or spoke with them by phone. We also interviewed their employees, handlers, rivals, peers and attorneys. Uncovering their fortunes required us to pore over thousands of SEC documents, court records, probate records and Web and print stories. We took into account all types of assets: stakes in public and private companies, real estate, art, yachts, planes, ranches, vineyards, jewelry, car collections and more." The list also comes with caveats. As Forbes noted last month, there are inherent limitations to creating the list. "Of course, we don't pretend to know what is listed on each billionaire's private balance sheet, although some candidates did provide paperwork to that effect," the explanation continued. "Some billionaires presiding over private companies were happy to share their financial figures, but others were less forthcoming." The revelations about Ross on Tuesday reverberated around Washington and Wall Street, cable news and Twitter. But some viewed the story as an indictment of Forbes' much-ballyhooed rankings. "The story also shows how fanciful the Forbes 400 list is," tweeted MarketWatch columnist Rex Nutting. "The Forbes 400 is as phony as Ross's fortune." Others credited Forbes for writing candidly about its previous shortcomings. 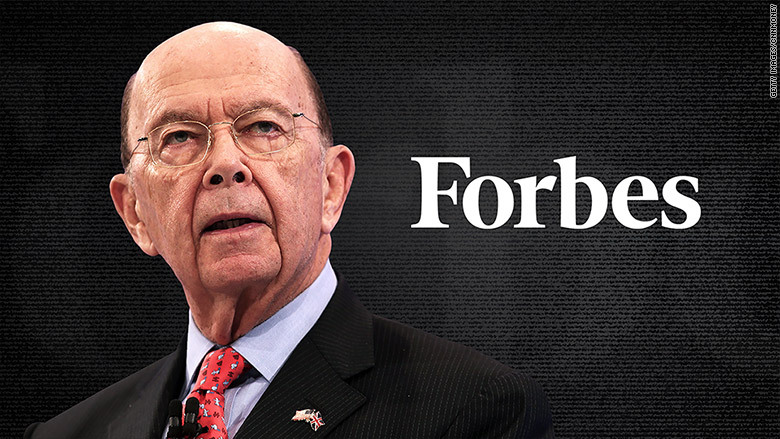 "The @Forbes story on Wilbur Ross's non-billions is a fine example of how to come clean about past reporting errors," said Bloomberg columnist Justin Fox. Forbes also pointed to its own previous reporting failures as a factor behind Ross' inclusion in the elite club. In the story on Tuesday, Alexander described a credulous correspondence between an ex-Forbes reporter and Ross. "I told him we're going to start him at $1 billion," the unnamed reporter wrote in his notes after speaking with Ross. "And he said 'Yep, fine, thank you.' "